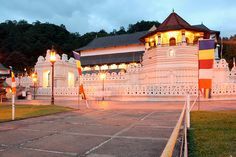 Dalada Maligawa - Temple of the Tooth The importance of Kandy is mainly due to being the home of the Dalada Maligawa, which houses the sacred tooth relic of the Buddha. The tooth relic itself is claimed to have come to Sri Lanka some 1600 years ago, when a certain princess from southern India brought it to Anuradhapura, which was then the most powerful kingdom in Sri Lanka. As king and kingdoms rose and fell, it finally ended up in around 1100AD.